THE HOUSE IS ROCKIN’- A TRIBUTE TO STEVIE RAY VAUGHAN. Twenty-five years ago, music was robbed of one of the most influential electric blues guitarists ever, Stevie Ray Vaughan. He was killed in a helicopter crash on August 27th 1990. The Texan blues man was just thirty-six, and had only enjoyed seven years in the spotlight. Despite only enjoying seven years at the top, Stevie Ray Vaughan has influenced several generations of musicians. This includes the musicians who pay tribute to Stevie Ray Vaughan on a compilation recently released by Cleopatra Records, The House Is Rockin’-A Tribute To Stevie Ray Vaughan. It features eleven tracks from likes of Trevor Rabin ,Steve Morse, John Sykes, Scott Hill, Walter Trout and Stanley Jordan. They pay tribute to a blues pioneer who first came to prominence in 1982. It was Stevie Ray Vaughan’s performance at 1982s Montreux Jazz Festival that transformed his career. From the moment he took to the stage, the twenty-eight year old bluesman had the audience spellbound. By the time he walked off the stage, a star had been born and Stevie Ray Vaughan’s career was transformed. However, Stevie Ray Vaughan was no overnight success. Ever since Stevie Ray Vaughan had dropped out of high school in 1971, he had been playing the blues. Having played in a series of bands, Stevie’s break came when he started playing with Marc Benno’s band The Nightcrawlers. After The Nighcrawlers, Stevie played with Danny Freeman in The Cobras. For Stevie, this was all part of his musical apprenticeship. Then in 1977, Stevie Ray Vaughan went from sideman to bandleader, when he formed Triple Threat Revue. Triple Threat Revue would later become Double Trouble. This came about, when Stevie Ray Vaughan brought onboard the rhythm section of drummer Chris Layton and bassist Tommy Shannon. It was with Double Trouble at his side, that Stevie Ray Vaughan announced his arrival at 1982s Montreux Jazz Festival. That night, at 1982s Montreux Jazz Festival, Stevie Ray Vaughan and Double Trouble announced their arrival. Stevie, playing vintage guitars, eschewed the use of effects. Effects were used sparingly during his performance. While Stevie turned his back on effects, he and Double Trouble liked to crank the sound up. To do this, they combined a series of amplifiers. This made the audience sit up and take notice. What they saw was a a blistering, virtuoso performance. By the time Stevie Ray Vaughan and Double Trouble left the stage, at 1982s Montreux Jazz Festival their star was in the ascendancy. Eleven months later, Stevie Ray Vaughan and Double Trouble released their debut album Texas Flood on Epic. It had been recorded before Stevie Ray Vaughan and Double Trouble signed to Epic. The ten tracks were recorded at Jackson Browne’s recording studio in Los Angeles. Stevie Ray Vaughan and Double Trouble worked quickly. The sessions took place between 22nd to 24th November 1982. These ten tracks that would become their debut album, Texas Flood. At Jackson Browne’s recording studio, Stevie Ray Vaughan and Double Trouble hooked up with engineer Richard Mullen. He would co-produced Texas Flood with Stevie Ray Vaughan and Double Trouble. Texas Flood featured ten tracks. Five were penned by Stevie, who also cowrote Dirty Pool with drummer Doyle Bramhall. Along with covers of Howlin’ Wolf’s Tell Me and Buddy Guy’s Mary Had a Little Lamb, these tracks became eventually become Texas Flood. On the first of the three days at Jackson Browne’s recording studio, Stevie Ray Vaughan and Double Trouble spent setting up their equipment. The next two days, Stevie Ray Vaughan and Double Trouble recorded what would become Texas Flood. Now all Stevie Ray Vaughan and Double Trouble needed, was a label to release Texas Flood. In early 1983, Epic signed Stevie Ray Vaughan and Double Trouble. Epic having heard the master tapes of Texas Flood, decided it needed remastered. So, a $65,000 advance was given to remaster the recordings. The advance also allowed Stevie to lay down his vocals Riverside Sound in Austin, Texas. Then on June 13th 1983, Texas Flood was released. On Texas Flood’s release, it was mostly, well received by critics. No wonder. Stevie Ray Vaughan was easily, one of music’s most exciting guitarists. However, Rolling Stone magazine and Robert Christgau, forever the contrarians, weren’t won over by Texas Flood. This didn’t affect sales of Texas Flood, which reached number thirty-eight in the US Billboard 200. Having sold two million copies, Texas Flood was certified double platinum. Following the success of Texas Flood, Stevie Ray Vaughan and Double Trouble headed out on a gruelling tour. For much of the remainder of 1983, Stevie Ray Vaughan and Double Trouble toured America and Canada. It was the longest and most punishing tour of Stevie Ray Vaughan and Double Trouble’s career. However, this was what life was going to be like for Stevie Ray Vaughan and Double Trouble. They were now on their way to becoming one of the most successful blues acts of the eighties. Just like Texas Flood, Couldn’t Stand the Weather, Stevie Ray Vaughan and Double Trouble’s sophomore album Stevie penned half the tracks. He wrote four of the eight tracks. The other four tracks were cover versions, including a cover of Jimi Hendrix’s Voodoo Child (Slight Return). These eight tracks were recorded at The Power Station, New York. Over nineteen days at The Power Station, Stevie Ray Vaughan and Double Trouble recorded Couldn’t Stand the Weather. Producing Couldn’t Stand the Weather, were Stevie Ray Vaughan and Double Trouble, Richard Mullen and Jim Capter. From the minute Stevie Ray Vaughan and Double Trouble laid down their cover of Tin Pan Alley, it was obvious to those in the control room that, here was a band at the top of their game. That proved to be the case. On the release of Couldn’t Stand the Weather, on 15th May 1984, Stevie Ray Vaughan and Double Trouble’s fusion of blues rock, electric blues and Texas rock, won friends and influenced people. This included the programmers at MTV. They put the video for Couldn’t Stand the Weather on heavy rotation. For Stevie Ray Vaughan and Double Trouble this meant their music reached a much wider audience. Then when critics heard Couldn’t Stand the Weather, it received widespread critical acclaim. So, it’s no surprise that Couldn’t Stand the Weather reached number thirty-one on the US Billboard 200 charts. This resulted in Couldn’t Stand the Weather being certified platinum. It seemed that Stevie Ray Vaughan and Double Trouble could do no wrong. In March 1985, Stevie Ray Vaughan and Double Trouble returned to the studio. This time, they headed to the Dallas Sound Lab. Between March and May 1985, Stevie Ray Vaughan and Double Trouble recorded the ten tracks that became Soul To Soul. For Soul To Soul, Stevie only penned four of the ten tracks. They were Only Say What, Ain’t Gone ‘N’ Give Up On Love, Empty Arms and Life Without You. Drummer Doyle Bramhall contributed Lookin’ Out the Window and Change It. The other tracks were cover versions, including Willie Dixon’s You’ll Be Mine and Earl King’s Come On. Just like Texas Flood, Soul To Soul was co-produced by Stevie Ray Vaughan and Double Trouble and Richard Mullen. Soul To Soul would be released on September 30th 1985. Before that, Stevie Ray Vaughan and Double Trouble made a triumphant return to where it all began, the Montreux Jazz Festival. Three years after making their breakthrough at 1982s Montreux Jazz Festival, Stevie Ray Vaughan and Double Trouble returned to where it all began. They played a storming ten song set. That night, just like three years earlier, Stevie Ray Vaughan and Double Trouble had the audience enthralled. Here was the most exciting blues band in the world. Since their Montreux debut, Stevie Ray Vaughan and Double Trouble had sold four million albums in America alone. Before long, four would become five. When critics heard Soul To Soul, it was well received by critics. Soul To Soul received the same critical acclaim as their two previous albums. Change It, one of two singles released from Soul To Soul, found flavour with MTV programmers. Despite this, Soul To Soul wasn’t as big a commercial success as Stevie Ray Vaughan and Double Trouble’s two previous albums. On the release of Soul To Soul on September 30th 1985, the album reached number thirty-four in the US Billboard 200 charts. In Canada, where Stevie Ray Vaughan and Double Trouble’s two previous albums were certified platinum, Soul To Soul was only certified gold. This was a troubling time for Stevie Ray Vaughan and Double Trouble. After the release of Soul To Soul, it would be four years before Stevie Ray Vaughan and Double Trouble released another album. During this period, Stevie’s appetite for drink and drugs couldn’t be sated. After breakfast, Stevie would begin his daily diet of a quart of whiskey and a quarter ounce of cocaine. This was Stevie’s daily diet. It would’ve killed most people. Not Stevie. He continued to record and play live. One of Stevie Ray Vaughan and Double Trouble live performances was released in July 1986, as Live Alive. Live Alive was a double album recorded during 1985 and 1986s Live Alive tour. Stevie Ray Vaughan and Double Trouble swagger their way through fourteen tracks on Live Alive. Despite his chaotic lifestyle, Stevie was still one of the best blues guitarists of his generation. Backed by the tightest of rhythm sections, Stevie unleashes a series of blistering performances. Whether it’s original songs or cover versions, they come alive in Stevie Ray Vaughan and Double Trouble’s hands. As a result, critics and record buyers were won over by Live Alive. Most critics gave Live Alive positive reviews. A few critics disagreed. However, that’s not surprising. Live albums always divide opinion. Not record buyers. When Live and Alive was released in July 1986, it reached number fifty-two in the US Billboard 200 charts. Although this was the lowest chart placing of any Stevie Ray Vaughan and Double Trouble album, Live Alive was certified platinum in America and Canada. This would be the last album Stevie Ray Vaughan and Double Trouble would release for three years. By the time Stevie Ray Vaughan and Double Trouble returned with their fourth album, In Step, Stevie was a changed man. Gone was the hard living, wild man, with the insatiable appetite for drink and drugs. This was reflected in some of the songs on In Step. For In Step, Stevie only wrote two tracks, Travis Walk and Riviera Paradise. However, Stevie cowrote four tracks with Doyle Bramhall. This included Wall of Denial and Tightrope, which reflect Stevie’s newfound sobriety. Along with covers of Willie Dixon’s Let Me Love You Baby, Buddy Guy’s Leave My Girl Alone and Howlin’ Wolf’s Love Me Darlin,’ these songs became In Step. Recording of In Step began on January 25th 1989 and lasted right through to March 13th 1989. Further sessions took place at Kiva Sudios, Memphis, and then in Los Angeles at Sound Castle and Summa Studios, where Double Trouble and Jim Gaines co-produced In Step. Once In Step was finished, it was released on June 6th 1989. Little did anyone know, but In Step would be the final album Stevie Ray Vaughan and Double Trouble would release. Less than a year later, on August 27th 1990, Stevie died in a helicopter crash. In Step was their swan-song. When In Step was released on June 6th 1989, what would be Stevie Ray Vaughan and Double Trouble swan-songs, was well received. In Step’s fusion of blues, rock and soul was perceived as an incredibly honest, personal and autobiographical album. This appealed to record buyers. On In Step’s release, it reached number thirty-three in the US Billboard 200 charts. This resulted in In Step being certified double platinum in America, and platinum in Canada. That meant that since 1983s Texas Flood, Stevie Ray Vaughan and Double Trouble had sold eight million albums. Sadly, In Step was the final Stevie Ray Vaughan and Double Trouble album released during Stevie’s lifetime. Since then, many artists have been influenced by Stevie Ray Vaughan and Double Trouble. No wonder. They were one of the most exciting and influential blues bands of the eighties. While Stevie Ray Vaughan and Double Trouble only enjoyed seven years in the spotlight, they made a lasting impression on musicians and record buyers. So, it’s no surprise that recently, Cleopatra Records released a tribute to Stevie Ray Vaughan, The House Is Rockin’-A Tribute To Stevie Ray Vaughan. It’s an eighteen track compilation, which I’ll pick the highlights of. 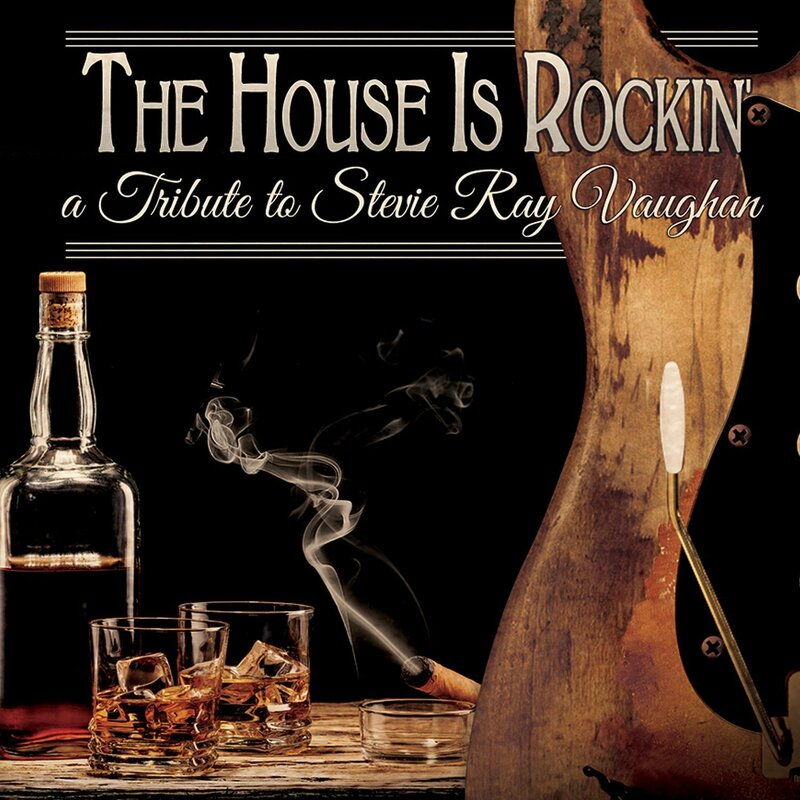 Trevor Rabin’s cover of Tightrope opens The House Is Rockin’-A Tribute To Stevie Ray Vaughan. It was released as single by Stevie Ray Vaughan and Double Trouble in 1989, and featured on their final album Tightrope. South African singer, songwriter, and producer unleashes a guitar masterclass on Tightrope, and in the process, conjures up the spirit of the late, great Stevie Ray Vaughan. Cold Shot is covered by Brooklyn born guitarist Steve Stevens. He joined One Hand Clap in 1979, and later, went on to work with everyone from Billy Idol to Ben Watkins, Faudel, Gregg Bissonette, Chris Squire and Billy Sherwood. With thirty-six years experience, it’s no surprise that Steve brings Cold Shot to life. It’s a track from Couldn’t Stand The Weather, Stevie Ray Vaughan and Double Trouble’s 1984 sophomore album. Steve Stevens delivers a lived-in vocal and a blistering, lightning fast guitar solo. For Stevie Ray Vaughan, The House Is Rockin’-A Tribute To Stevie Ray Vaughan, Steve Morse chose to cover Travis Walk, a track from Stevie Ray Vaughan and Double Trouble’s 1989 swan-song In Step. The former Deep Purple and Kansas guitarist joins forces with a tight, talented band. While they all enjoy the opportunity to take centre-stage, Steve steals the show on this blues rock instrumental. Albert Ammons and Pete Johnson collaborate on Empty Arms. It featured on Stevie Ray Vaughan and Double Trouble’s 1985 album Soul To Soul. Six years later, Empty Arms was released as a single. Tragically, Stevie Ray Vaughan had died the year before. The single was a reminder of what Stevie Ray Vaughan and Double Trouble. As for Albert Ammons and Pete Johnson’s cover of Empty Arms, it’s a delicious fusion of blues and boogie woogie. John Sykes covers Pride and Joy on The House Is Rockin’-A Tribute To Stevie Ray Vaughan. It was released as a single in 1983, and featured on Texas Flood. This was Stevie Ray Vaughan and Double Trouble’s debut album. It’s brought to life by John Sykes. He’s played with Streetfighter, Tygers Of Pan Tang, Badlands, Thin Lizzy, Whitesnake and Blue Murder. His five decades of experience shines through on Pride and Joy. He lives the lyrics before unleashing a scorching, searing soaring guitar solo. Seamlessly, his fingers fly up and down the fretboard, as the English born guitarist delivers what can only be described as a musical tour de force. With the whole of Stevie Ray Vaughan and Double Trouble’s back-catalogue to choose from, Scott Hill was spoiled for choice. However, he chose Couldn’t Stand The Weather, the title track to Stevie Ray Vaughan and Double Trouble’s 1984 album. It’s something of a slow burner. Scott teases the listener before hitting his stride and delivering a fitting blues rock homage to Stevie Ray Vaughan. Ain’t Gone ‘N’ Give Up On Love featured on Stevie Ray Vaughan and Double Trouble’s 1985 album Soul To Soul. Thirty years later, and Mark Kendall, the Great White lead guitarist covers the song on The House Is Rockin’-A Tribute To Stevie Ray Vaughan. Mark’s cover has a slow, moody and bluesy backdrop, while his vocal veers between needy and hopeful. When this is combined, it’s one of the highlights of The House Is Rockin’-A Tribute To Stevie Ray Vaughan. Although Los Angeles based guitarist Doug Aldrich is only forty-one, he’s a veteran of many groups. This included Bad Moon Rising, Burning Rain, Dio, Hurricane, Lion, Mansfield, Revolution Saints, The Brutal Brothers and Whitesnake. In 1994, Doug relaxed the first of five solo albums. The hard rocking guitarist covers The House Is Rockin’, which opened In Step, Stevie Ray Vaughan and Double Trouble’s final album. It was also released as a single in 1989, and lents its title to the compilation. Doug Aldrich stays true to the original, and comes up with a version of The House Is Rockin’ that would get any house rocking. Richie Kotzen solo career began back in 1989. Since then, he’s released around twenty albums. He covers Honey Bee, a track from Stevie Ray Vaughan and Double Trouble’s 1985 album Couldn’t Stand The Weather. Drawing on four decades of experience, Richie delivers a strutting slice of blues rock. For anyone whose still to discover the one and only Walter Trout, The House Is Rockin’-A Tribute To Stevie Ray Vaughan is the perfect opportunity. He was formerly a member of Canned Heat and John Mayall and The Bluesbreakers. Here, Walter covers Say What!, a track from Stevie Ray Vaughan and Double Trouble’s 1985 album Soul To Soul. It’s as if Walter’s heard what’s gone before, and decides to blow the opposition away. That’s what he proceeds to do over the next four-and-a-half minutes. What follows is some of the best guitar playing on The House Is Rockin’-A Tribute To Stevie Ray Vaughan. It’s a fitting tribute to Stevie Ray Vaughan. Stanley Jordan’s cover of Riviera Paradise closes The House Is Rockin’-A Tribute To Stevie Ray Vaughan. Fittingly, Riviera Paradise is a track from what proved to be Stevie Ray Vaughan and Double Trouble’s final album In Step. It was released in 1989. A year later, in 1990, and Stevie Ray Vaughan was dead. That day music lost one of its greats. Twenty-five years later, and Stanley Jordan delivers a mellow, melancholy and jazz-tinged cover of Riviera Paradise. It later veers in the direction of fusion. However, mostly, it’s a beautiful, thoughtful sounding track that allows the listener to remember the late, great, Stevie Ray Vaughan. It’s hard to believe it’s nearly twenty-five years since Stevie Ray Vaughan died. Sadly, apart from the release of The Complete Epic Recordings box set, tributes to one of the greatest guitarists of his generation have been few and far between. That’s sad, given that Stevie Ray Vaughan influenced several generations of musicians. To this day, musicians cite Stevie Ray Vaughan as an influence. No wonder. He was one of the greatest blues guitarists of his generation. Sadly, Stevie Ray Vaughan was only in the spotlight for seven years. During the seven years that Stevie Ray Vaughan and Double Trouble’s star was in the ascendancy, they released four studio albums and one live album. Their swan-song was In Step, which was released in 1989. By then, Stevie had turned his life around. No longer was he living the rock ’n’ roll lifestyle. Stevie was a changed man. Gone was the hard living, wild man, with the insatiable appetite for drink and drugs. The change in Stevie Ray Vaughan was reflected on In Step’s lyrics. It introduced the listener to a new, changed Stevie Ray Vaughan. They liked what they heard, and In Step reached number thirty-three in the US Billboard 200 charts. This resulted in In Step being certified double platinum in America, and platinum in Canada. Stevie Ray Vaughan and Double Trouble looked like becoming one of the biggest bands of the nineties. They had already sold over eight million copies between 1982 and 1989. Sadly, that never happened. On August 27th 1990 Stevie Ray Vaughan was killed in a helicopter crash. He was only thirty-six years old. That day music lost one of its most talented sons. That’s why to mark the twenty-fifth anniversary of Stevie Ray Vaughan’s death, Cleopatra Records have released The House Is Rockin’-A Tribute To Stevie Ray Vaughan. It features a series of guitar masterclasses from musicians of the calibre of Trevor Rabin ,Steve Morse, John Sykes, Scott Hill, Walter Trout and Stanley Jordan. They ensure that The House Is Rockin’, which seems a fitting way to celebrate the life and career of a modern blues legend, Stevie Ray Vaughan. ← JETHRO TULL-THICK AS A BRICK-STEVEN WILSON MIX.